Jane realised a lifelong dream of working with horses when she moved to her property in Terrey Hills on Sydney’s Northern Beaches in 2011. Her passion for horses that had until then been a serious hobby became a full time job. Jane set up Willow Wood Stables as a performance horse agistment, training and coaching facility, and has qualified as a riding coach. Jane has been blown away by the positive effect horses have on people, especially non-horsey people. 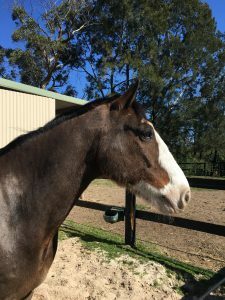 Keen to share this special insight with a broader range of people, she qualified as an Equine Assisted Learning facilitator and established Leading Edge Life Skills in March 2015. 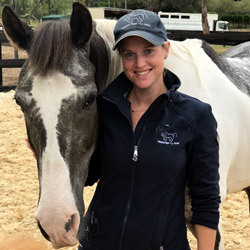 In January 2017, Jane undertook further training to become the only certified instructor in the southern hemisphere for Equine Connection. Prior to opening Willow Wood Stables, Jane worked in corporate marketing and public relations both in Australia and internationally.Jane lived in Germany for six years and was a marketing communications manager for SAP Software at their headquarters in Waldorf, Germany. She was responsible for the Asia Pacific region and helped launch SAP in China over 20 years ago. After returning to Australia, Jane has had various marketing and public relations roles in both corporate companies and consultancies, including Minter Ellison Lawyers, Growing Daily Public Relations and Kardan Consulting and has worked with clients from various industries including banking and finance, engineering, consumer and retail as well as some not-for-profit organisations. Alice joined the Leading Edge Life team in early 2017 as a facilitator and Director of Marketing and Business Development. With a corporate background in Human Resources, she now combines her Learning and Development experience with her love for horses. Working across all our programs, Alice is passionate about ensuring our clients achieve genuine and sustainable growth opportunities through our experiential learning based curriculum. She brings a wealth of experience in skill development having supported clients through the design and facilitation of programs to build skills such as Leadership, Management, Communication Negotiation and Team Building. Prior to joining the team, Alice was Vice President, Human Resources at the Macquarie Group in New York and Sydney. Through her career she has held a number of HR Business Partner and HR Specialist roles for leading Investment Banks including UBS and Barclays. She started her career in Australia, before spending over 10 years based in the US, UK and Middle East. Alice is an accredited NCAS riding Coach and when not in the office she enjoys riding and spending time with the horses. Jenny is the owner and manager of Taronnah, our newest Leading Edge Life Skills venue. With its exceptional facilities, including a full size indoor arena, we are able to broaden our capacity to provide life changing skill development programs for young people and adults. Jenny and her husband Dave have been married for over 16 years and they have 3 terrific teenage children who enjoy being outdoors riding their mountain bikes and their horses. In addition to their own children, Dave & Jenny have had the privilege of being short-term foster carers for many treasured babies over the last couple of decades. They have a heart for children and are passionate about providing a loving and supportive family environment for those who need it most. Jenny is an avid reader and is always on the look out for new and exciting adventures for she and Dave, their kids and of course their animals! 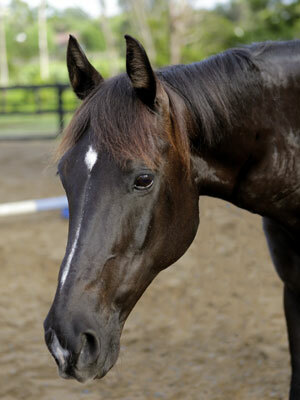 Opal is a beautiful black Australian Stock Horse mare. She is an extremely versatile little horse, having done cattle work, sporting, dressage and show jumping. Opal is highly intelligent and very friendly. She enjoys hanging out with her two legged friends especially when there are carrots involved! Opal had her first foal – a bay colt – in October 2013. Her baby is now taller than her! Opal is enjoying being an EAL horse and has a lot to teach us humans. 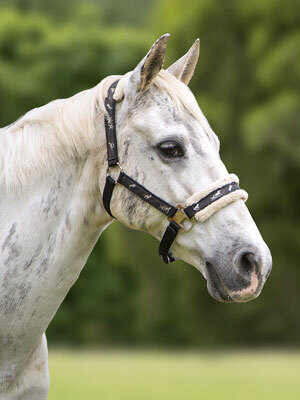 Bart is the character of the stables. His cheeky lovable nature wins him friends of all ages. 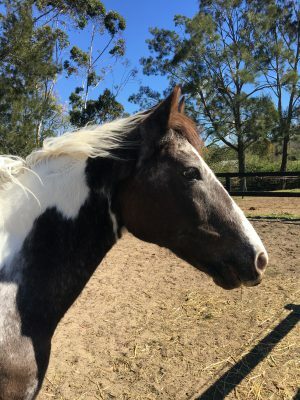 He is a white (called grey in the equestrian world) Australian Stock Horse gelding with unusual black splashes on his left ear and down his neck. Bart survived a major operation in early 2014 to remove a large benign tumour from his stomach. He has recovered so well and is indeed more spritely than ever. When he is not being an EAL horse, Bart is a super competitive show jumping horse, helping his 11 year old rider win many ribbons. Vin Diesel or “Vinnie” as he is affectionately known, is a very special boy. He came to us after his young owner passed away in a tragic accident. They had such a special partnership that her parents could not bear to see anyone else riding him. However, they wanted him to have purpose and have given him to us so he can help other people. Vinnie is an absolute darling and an amazing communicator. Amber is the older lady of the team and has an attitude typical of wise older women. 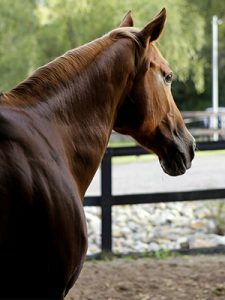 She is a chestnut coloured Arab/Warmblood cross mare who excelled as a competitive dressage horse in her younger years. She is now making people happy being a super teacher and a pleasure riding horse. She enjoys her role as an EAL teacher as she has a lot to show us mere mortals! Cal is our beautiful Clydesdale cross gelding – our gentle giant. With his striking blaze and socks, he looks like a Budweiser horse! Despite his size, he is a super jumping and dressage horse. Cal has a great sense of humour and always makes everyone laugh. Our beautiful blonde Hannovarian mare is named after the iconic Kylie Minogue. Kylie was once the horse of Australian Olympic 3 Day Event rider, Stuart Tinney. She is now a successful Junior Show Jumper and an EAL horse. Kylie is a mum herself and is very sweet and nurturing. Frankie is really part of the management team. Standing at a mighty 8 hands high (approximately 80 cm) at the shoulder, his job is to charm our clients with his cuteness and be our model for our horse body language and safety demonstrations. People often ask will Frankie grow any more as he is so small, but he is actually quite an elderly gentleman so has reached his full height. 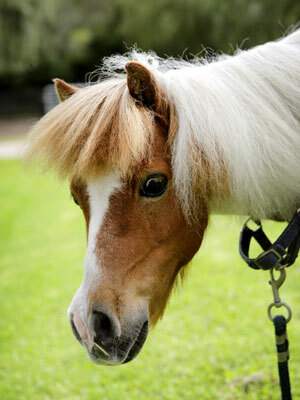 He is a miniature pony – considerably smaller than the well-known Shetland pony. You may recognise Frankie from his starring role in the recent TV commercial for Yates Lawn Food.